WELCOME TO 602 CRESTWOOD DR. This property brings it all together location, luxury, and technology. The 6,200 square foot house sits on 5 acres with mature trees, a private backyard setting, fully-irrigated lawn, and a barn for your horse(s).The location to everything in the Greenville could not be any better. Restaurants and shopping are minutes away at Cherrydale Point. Historical downtown Greenville is less than a 10 minute drive and Paris Mountain State Park sits nearby for enjoying the benefits of an outdoor life. The propertys multiple outdoor spaces will also capture your attention with its TimberTech porches, wood-burning fireplace with gas starter, retractable screens and paneling, and an outdoor-accessible, heated and cooled bathroom. The detailed, luxurious touches extend from the kitchen to the living spaces to the bathrooms and beyond. The floors are Palmetto Road Chalmers handcrafted wood. The refrigerator even has a built-in coffee dispensera luxury for any morning. From the custom-built cabinetry with Fantasy Macaubus Quartzite countertops that adorn the kitchen to the master bath that boasts a Victoria & Albert tub and marble throughout, this house has it all. 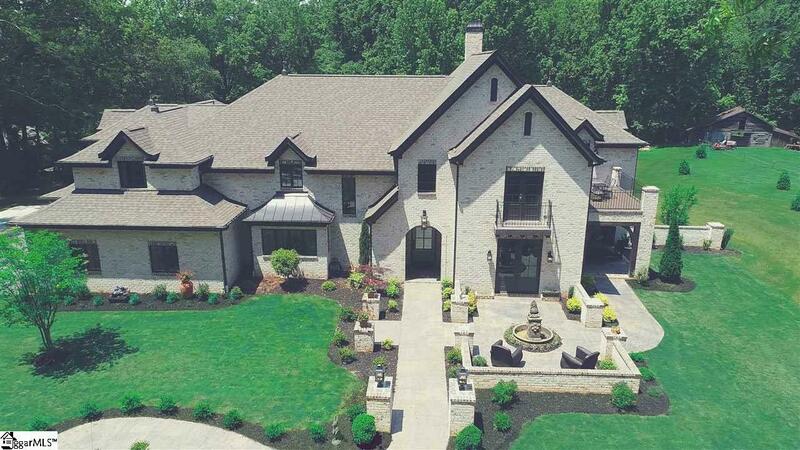 This home is connected by a full-home automation system with audio-video technology, wifi-speakers, and security systems with eight cameras. The system's audio capabilities envelop the whole house, including the back porch, and even the garage.The home's four Ecobee thermostats are Alexa ready to control with merely the sound of your voice, and even the garage doors are wifi-enabled, allowing technology to make even coming and going from this house easier. As if this home did not already have everything you could want, upstairs there is an UNBELIEVABLE entertainment room. This room includes a theatre featuring a 120-inch screen with an 11-speaker, two-subwoofer Dolby Atmos system, along with auto-dimming lighting a kitchenette so there is no need to go downstairs during the big games or movies. An outdoor sitting area and custom sitting bar where you can eat or just take a little break. And last but not least a Full Swing golf simulator where you can play your friends or just groove in your swing. If you are looking for the perfect blend of luxurious, technological, convenience, and private then welcome to your new home!